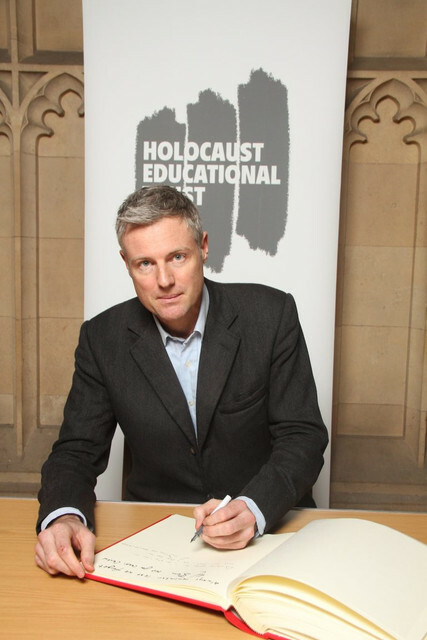 This week Zac Goldsmith MP signed the Holocaust Educational Trust’s Book of Commitment, in doing so pledging his commitment to Holocaust Memorial Day and honouring those who were murdered during the Holocaust as well as paying tribute to the extraordinary Holocaust survivors who work tirelessly to educate young people today. In the lead up to and on Holocaust Memorial Day, thousands of commemorative events will be arranged by schools, faith groups and community organisations across the country, remembering all the victims of the Holocaust and subsequent genocides. The theme for this year’s commemorations is ‘The power of words’. The Holocaust Educational Trust was founded in 1988 during the passage of the War Crimes Act. Our aim is to raise awareness and understanding in schools and amongst the wider public of the Holocaust and its relevance today. We believe that the Holocaust must have a permanent place in our nation’s collective memory. One of the Trust’s earliest achievements was to ensure that the Holocaust was included in the National Curriculum for England in 1991 – for Key Stage 3 students (11-14 year olds). The Holocaust has remained on the National Curriculum since then. We also successfully campaigned to have the assets of Holocaust victims and survivors released and returned to their rightful owners in the late 1990s. Since 1999 the Trust’s Lessons from Auschwitz Project has given thousands of post-16 students and teachers the opportunity to visit the Nazi concentration and death camp Auschwitz-Birkenau as part of a four-part educational programme. Since 2006 the Project has received Government funding. In 2010 the Government issued a new award to recognise the British men and women who came to the aid of Jewish people and other persecuted groups during the Holocaust – as a direct result of an initiative by the Trust to raise their profile and secure formal recognition for them. At the Holocaust Educational Trust’s Appeal Dinner in September 2013, the Prime Minister announced the establishment of a national Holocaust Commission to establish what further measures should be taken to ensure a lasting memorial to the Holocaust in this country. In January 2015, the Prime Minister, with cross-party support, endorsed the recommendations of the Commission, which will include a striking new national memorial and accompanying learning centre by 2020. In January 2015, the Chancellor of the Exchequer announced that the Royal Mint has commissioned a special commemorative medal to mark 70 years since the end of the Holocaust, an initiative of the Holocaust Educational Trust. We work in schools, colleges and higher education institutions, providing teacher training workshops and lectures, as well as teaching aids and resource materials. Holocaust Memorial Day was established following an MP’s visit to Auschwitz-Birkenau with the Holocaust Educational Trust. Moved by his visit, Andrew Dismore MP proposed a bill, “to introduce a day to learn and remember the Holocaust” on 30 June 1999. The Holocaust Educational Trust has been closely involved in the establishment and development of Holocaust Memorial Day since its inception in 2000. The theme for the UK Holocaust Memorial Day 2018 is ‘The power of words’.